Does super premium pet food have to come at a super premium price? When you buy big brand, big name petfoods, you pay a big brand price! What are you paying for? Fancy bags, Free offers, television adverts, event sponsorship, area reps, their cars, their travelling expenses, Wagons and warehousing. Wheat gluten free a nutritious food which provides all the essential nutrients required for active, healthy Dogs. There are no artificial colours or flavours, which are often the source of chronic skin irritations and hyperactive behaviour. 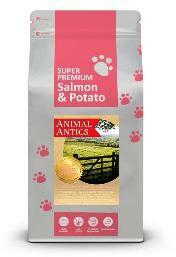 A highly palatable hypo-allergenic food for all dogs  particularly suitable for fussy or sensitive dogs. Ingredients 24% Salmon, 12.5% Salmon Meal, Potato 26%, Oats, Maize, Beet Pulp, Poultry Fat, Salmon Gravy, Minerals, Salmon Oil, Vitamins.